The year is 1999. Amamori Hajime is just a normal, everyday elementary school student, trying to study and hanging out with his crazy pals. But then one day as his father is testing a piece of equipment he has been working on, something causes it to blow up, taking the house with it! Now orphaned, Hajime is taken in by his uncle, who is an astronomer. There at his uncle`s observatory, he meets a girl he`s seen before and developed somewhat of a crush on. He finds out her name is Yukino Yayoi, and her parents run a ramen shop in town. But even better than that, she`s his uncle`s assistant! What luck! But Yayoi isn`t exactly what she seems. There is a reason she helps out Amamori-san at the observatory. She is the Millennial Queen (Sen-Nen Joou), specially chosen by her home planet, LaMetal, to go to Earth and help prepare for the possible annihilation of the planet. What will cause this disaster? LaMetal has an extremely elliptical orbit, which sends it very, very near Earth every 1000 years. When it gets close enough, the earth reacts, causing all sorts of natural disasters. Although she was chosen with the idea of protecting LaMetal in mind, her personal plan is to evacuate as many humans as she can to LaMetal, so if their planet is destroyed, they will survive. However, there is one person who strives to stop her plan, the head of the Millennial Theives. Why does he want to stop Yayoi? And how does he know about the Millennial Queen, anyway? 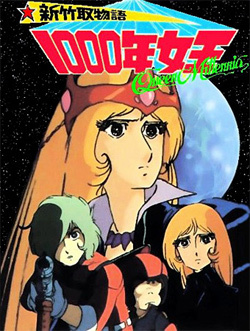 Queen Millennia is Leiji Matsumoto`s classic anime series. Though not as famous as other Matsumoto shows in the west, it was a huge hit in Asia. This show has an intricate and intelligent plot, plus some hauntingly beautiful background music. The contrasting fragility and strength of Yukino Yayoi distinguishes her as one of the most memorable characters in anime. Info stolen from http://anidb.info/perl-bin/animedb.pl?show=anime&aid=366 until we write our own. is powered by	WordPress 5.1.1 and delivered to you in 0.532 seconds using 77 queries.